Each Side Vessel has a puzzle piece and on the heart vessel the pieces are connected. As the minister says the following wording, the couple alternately pours sand into the glass vessel to form a layered design with the sand. 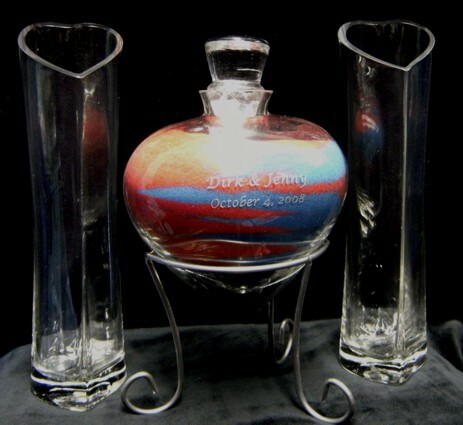 Here is an idea for a second marriage with children, have a forth vessel with another colored sand. Let the children pour some sand in the bottom of the vessel first and then start alternating the couple pouring sand. What a great way to make the children apart of the new union. “Today, __________ and __________, you are making a commitment of your eternal commitment for one another as well as to your children, __________, ___________,etc. As you each hold your sand the separate vessels of sand represent your lives up to this moment; individual and unique. As you now combine your sand together, all your lives from this moment will become one family. As the minister says the following wording, the couple alternately pours sand into the glass vessel. As you can see, the Unity Sand Ceremony can be done many different ways. It’s OK to take parts of any of these ceremonies and make your own version. This is all about you having a unique special experience on your wedding day. 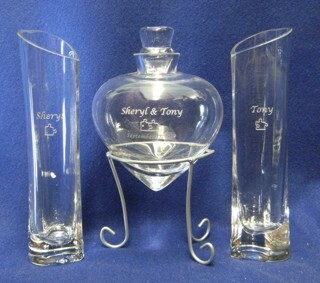 We suggest the vessel the sand is poured into should have the couple’s first names engraved on it with the wedding date underneath. The pouring vessels should have his name on one and her name on the other. After the wedding I suggest displaying them on each side with dried flowers (from the wedding). On your anniversary put fresh flowers in them. You will enjoy your Unity Sand Set for years to come and bring back memories of that special day. The Hawaiians used sand from the beach for the ceremony. 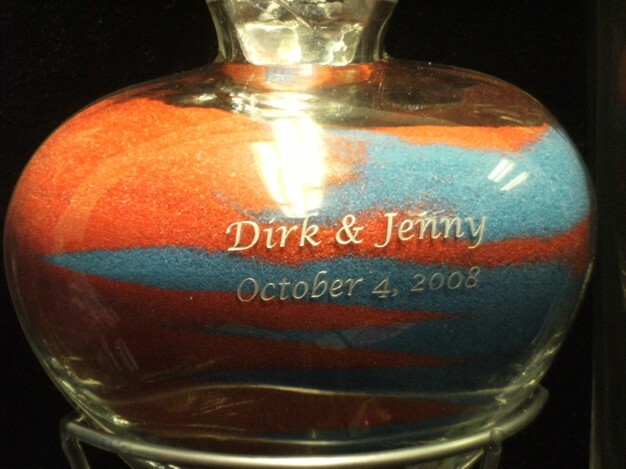 Today most couples use colored sands poured alternately into the vessel. This way you can see the sands coming together in a beautiful design. Some people will put a little sand from where they are married in the bottom (in keeping with the Hawaiian tradition) of the vessel and then pour their colored sands on top. In second marriages, the children can pour in sand that represents them in the marriage. One of the ceremonies listed above shows you how to do this in the ceremony. Please note: too many color sands in the vessel, start to look funky and make sure your color choices complement each other. One common choice of colored sands is black for the groom and white for the bride. Some couples use their favorite colors or colors that are used in the wedding. Many couples will dress up the vessel with a ribbon and have a special table set up off to the side just as the unity candle ceremony is done. It is all about making your wedding special for you and your guests. Doing the Sand Ceremony is one wonderful way to make your special day more symbolic of your union together. The video shows the Wave Sand Ceremony Set and suggested vows to use for a second marriage with children. 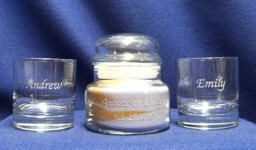 You can purchase the Wave Sand Ceremony set on the left side of this page.